A little over three short months ago, many of our agents gathered together at AgentLynx 2018 in San Diego, where we announced new products, held group sessions, and allowed you to speak directly with the EZLynx Team about our products. 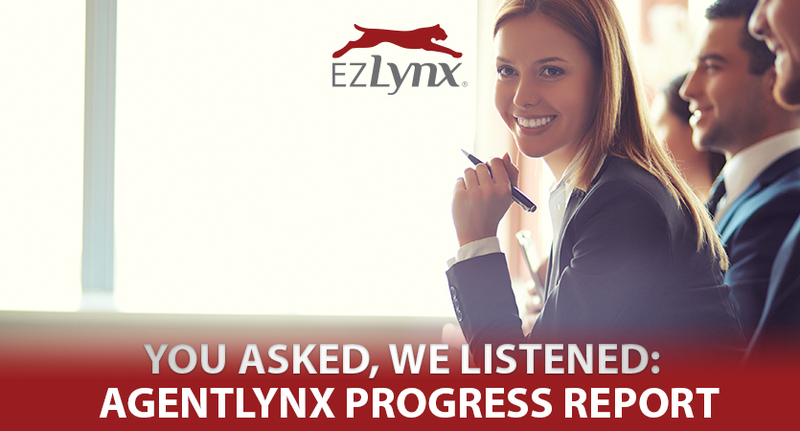 We listened to your requests for new features, and we heard how EZLynx could further accommodate the needs of your agency. With our release in mid-July and in the coming months, we are thrilled to be able to provide you with the first round of solutions to many of the requests and challenges you shared with us at AgentLynx. In response to your requests at AgentLynx, we committed to bringing you a more efficient, sleeker EZLynx Outlook plugin with updates to performance, workflow and features. These enhancements will make Outlook feel like an extension of EZLynx. We heard your concerns with the functionality of the plugin when you utilize Outlook on multiple devices. With this new enhancement to your Outlook plug in, seamlessly switch between home and work devices without worrying about receiving multiple automatic save dialogue boxes when you open Outlook. In addition to simply documenting your emails in EZLynx, these Outlook plugin enhancements will allow you to select a specific task to associate with the email, attachments, and/or note; reopen or close a task from within the plugin; and add a reminder. For users with the Enhanced Workspace, you will now have the ability to mark a task as important and set its due date and time directly from the plugin. Although you already had the ability to import attachments to EZLynx, the enhancement takes document management abilities to the next level, giving you the ability to preview documents, save documents to specific folders, and disable automatic saving of embedded images so you do not end up with unwanted email signature images in EZLynx. We updated the Agency Workspace within Outlook as well, giving you the ability to add labels and mark emails with a sticky note, and we are improving your workflow by giving you the option to search and save to a different applicant within the workflow, even if matched to an applicant automatically. These enhancements will be automatically applied to your existing Outlook plug-in. Soon EZLynx will feature integration with CoreLogic® to bring you residential prefill and reconstruction cost valuation powered by Marshall & Swift™. Residential prefill will drastically improve your home quote process by allowing you to use MSB lookup within EZLynx to automatically pull information about a home prospect. You can further improve your process with the MSB reconstruction cost valuation tool to predict the cost of replacing the entire home. Both services will be available at a competitive, cost-efficient rate per transaction. CoreLogic, the CoreLogic logo, and Marshall & Swift are trademarks of CoreLogic, Inc. and/or its subsidiaries. In the coming months we will be rolling out support for non-owners and broad form auto policy types, which has been a highly requested feature for many of our users. Read Only User access for reports gives you more control over your data by allowing you to send reports to other users in your agency without having to give them access to all your reporting. This will keep your data secure within your organization. Contact customer support to activate this feature. Additional efforts to increase your productivity and help you manage your data, we have made improvements to our document capabilities to now allow you to move or delete more than one document at once and share multiple documents to the Client Center simultaneously. The first of several Activity and Agency Workspace enhancements, we have enhanced your ability to associate notes with policies in order to increase your productivity and make it easier to stay organized. You can now associate a policy number with a note at any time, rather than only having this capability when you first created the note. If you need to move a policy to another individual, all the notes associated with that policy will now be carried over to the new assigned user. To help you stay more organized, we will soon allow for additional addresses, including military addresses, to be stored and associated with one customer’s account. Users with EZLynx Accounting will have the ability to directly include billing address information on invoices. The enhancement will also allow you to select the proper address from the addresses associated with a policy when sending postal mail through Communication Center. This feature is coming soon. These enhancements and features are just the start. We have committed to bringing you even more of the changes and features that you have requested. We take your suggestions seriously, and we are always looking for ways to make improvements that will benefit your agency. The opportunity to provide face-to-face feedback to the EZLynx Team is part of the main value of attending our user conference. AgentLynx helps our teams hear the unified voices of multiple agents and allows us to understand and address the top business challenges that many of our users face. It also provides you with the opportunity to network and collaborate on the best strategies for using EZLynx with other agents and EZLynx team members. We hope to see you at the next AgentLynx Conference in Fort Worth, Texas in 2019!